In astrology, Full Moons, New Moons, Solar Eclipses and Lunar Eclipses are called lunations. Much focus on astrology is directed to these subjects because most people know little else about depth astrology. That’s totally understandable. The Sun and Moon are known as the lights, and are of extreme importance in this art/science. Yes, they are treated as planets as are “minor planets” Chiron and Pluto. These lunations are GREATLY misunderstood, and I will attempt to show you why. Yes, we have tons written about starting new ventures when the Moon is New (that’s when the Moon is between the Sun and Earth) and are in a straight line. Furthermore, when the 3 are in a straight line horizontally AND vertically, that’s when you have a Solar Eclipse. Reversing the process, when the Earth is in between the Sun and Moon, we get a Full Moon and a Lunar Eclipse respectively. Much is said about the nature of the Full Moon or so and it is rather obvious that these periods which can last from 2 days up to 10 days “cause events.” Lots of spooky movies pivot around these lunations. That’s because, frankly, the Moon IS nuts! It rules our emotions and our unconscious – enough said. Being more forthright, the planets do not cause things to happen, but for our purposes, we will act as if it is so. What sign is the lunation happening in? Are other planets involved in the lunation besides the Sun and Moon? What houses are the Sun and Moon activating in your chart? What, if any, sensitive points in your natal chart are being triggered by the lunation? These are GREAT ARE BIG ISSUES THAT ARE USUALLY IGNORED COMPLETELY. You hear for example, “The Full Moon will be in Virgo, it’s a Harvest Moon….,” etc. First of all, all Full Moons are moody because the Moon is involved! Some are moodier than others. Full Moons are the answer to the preceding New Moon. New Moons mark the time of endings and beginnings. Full Moons are the answer to, “With what we know about this issue, how is it going? Are we going to continue down this same path?” This is one reason we experience Full Moons as eventful and others we just drive by and comment on how pretty it is. Not all lunations “cause things to happen.” With said Full Moon in the sign of Virgo, yes, we would feel the Virgo archetype rather strongly. As with the nature of Virgo, many people find themselves fanatically cleaning the house and getting “their own” house in order. Perfect. Simple. Full Moon in Virgo = you feel Virgoan. Combining the Moon with Virgo, we sometimes feel like “cleaning up our feelings.” See? Astrology is simply an art of combining archetypes (deep distinct universal forces). But, that’s usually all you hear and frankly, in most cases the interpretations are way off, misleading or incomplete at best. Let’s continue. Likewise, if the simple New Moon is in Aries, we feel like coming out of the starting gate with great gusto and no complications! That’s Aries. If the Lunar Eclipse is in Aquarius, it may be kind of chaotic times (since Aquarius is ruled by unpredictable Uranus) and we may feel rather feverish about saving the world (Aquarius.) So far, it’s rather easy to see that the sign in which the lunation appears denotes the feeling or tone of the lunation. This is why Full Moons in Sagittarius are less moody that those in Capricorn, and therefore usually carry a more festive spirit. If you look at all of the planets and pretty much see the lunation happening all by itself, it usually won’t be that complicated or forceful. That means no other planet is lined up with it. 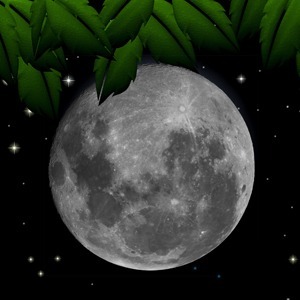 For instance, let’s say the Full Moon is happening tonight at 15 degrees of Aries. It may just happen that no other transiting planets are in mid-Aries, mid-Libra (its opposite point) or mid-Capricorn or mid-Cancer, (the right-angle, or square points.) In this case, the lunation is basically uncomplicated and this point can pretty much be seen as a simple Full Moon. BUT, if transiting Uranus is sitting at 12 degrees, just 3 degrees away from the lunation point of 15 Aries, WATCH OUT! This will be extremely explosive and/or liberating. Especially TWO DAYS LATER when the Sun progresses to the 14th degree and triggers the Uranus from one degree away. Why? Because as Uranus sits there (it’s not sitting, it’s actually screaming through space but it has such a long way to go in its orbit that it appears to be moving quite slowly) it BUILDS UP TENSION. Then, boom! The Full Moon TRIGGERS the tightly wound Uranus and releases the all the kinetic energy! What started out to be (and what many writers still insist upon) a simple Full Moon in Aries becomes almost entirely engulfed in AQUARIAN, URANIAN explosive energies. That’s because the planet Uranus and the sign of Aquarius are quite similar. Then, add to it the fact that the Full Moon IS in Aries, and Aries itself is an explosive, self-oriented energy… Uranus and Aries get along well together – they explode into action and we end up saying things like, “I’VE HAD ENOUGH – I’VE HAD IT UP TO HERE!” This is why. Both planets are very restless and support each other’s fiery active natures. Let’s take another example, let’s assume we are experiencing a Solar Eclipse (New Moon) at the 10th degree of Taurus, a very stable sign. If that lunation were lined up with Uranus, it would be less explosive because of the mere stability and strength of the sign of Taurus. You have to mix all the energies into one translation. This is also why the stories of some lunations seem to have several smaller sub-chapters to them – the archetypes are mixing and colliding. If Neptune is sitting at 20 degrees of Pisces while the Lunar Eclipse (Full Moon) is occurring at the 21st degree of Virgo (directly opposite the zodiac), we will NOT experience the clarity and specificity of Virgo since NEPTUNE IS IN THE WAY. Neptune’s nature is practically the reverse of Virgo. Muddy vs clarity. Inclusive vs exclusive. Indiscriminate vs discriminating, etc. So, it can be a wash, pun intended. The really volatile lunations are like the ones we are seeing now. Since transiting Uranus and Pluto are pretty much traveling at a right angle to each other around the 10th degree of Cardinal signs, i.e., Aries, Cancer, Libra and Capricorn, any lunation happening along that Cardinal Cross will indeed set off this extreme tension of Uranus/Pluto. This is WHY we’re seeing issues about guns, taking down the Plutocracy, governments and economies on the verge of collapse, dire situations. Complete National Identity Crisis. The planets are not punishing us, we have gotten away from our mission. Period. So we see, added planets in addition to the lunation get triggered by the lunation, therefore the feel or nature of the lunation acts much more like the involved planets rather than the sign in which the lunation is forming. This is not the time or place to go into a lengthy description of the 12 houses of the natal chart. If, for example, the New Moon happens at the 5th degree of Capricorn and that POINT falls in your 4th house, you will feel like changing your family situation so that you get more emotional support! Why, the Capricorn energy of the lunation makes you feel like “making sure” things work, and since it is being experienced by you in your 4th house of family, emotions and home, put the two concepts together. An energetic Solar Eclipse is happening in Leo in your 7th house of relationships… You will feel like asserting yourself with your mate and possibly demanding more respect. Why? Leo’s commands respect and we see it occurring in the house of all of your relationships. This is another simple reason why lunations are so seemingly unpredictable. It’s NOT that they are, it’s more to the fact that almost no one knows where their astrological houses are let alone how to look them up or translate them. Therefore, the same lunation in your 1st house may be experienced totally differently in my 12th house. See how complex it is? That’s why you CAN’T get very accurate lunation interpretations ahead of time because each of our charts is so individuated. The permutations are endless. Yet, astrology survives. That’s why it’s so powerful, accurate, and well uh, exquisite. If your Venus sits at 12 degrees of Pisces, a very sensitive point, while the Solar Eclipse forms at 14 degrees of Virgo WITH MARS. Boy, is your Venus going to be energized! See? All the action (Sun, Moon & Mars) is opposite your tender, vulnerable Venus! You’ll be knocked on your heels while everyone else is sitting around humming a different tune. One more example: if your chart has a major triangle, or what we call a T-square, you could really be affected by a lunation. Let’s say your Moon is in Cancer opposite Pluto in Capricorn, all making a right-angle to Mars in Libra. There is great tension ANYTIME anyone of the points of the triangle gets triggered. So, if a New Moon comes along near the same point as your Mars, Martian type things are going to happen! In other words, Mars says, “Hey, let’s get moving here! Let’s see something done about this?” Aggression/assertiveness will be aplenty because of Mars. This is precisely what happened to the chart of the NRA on the DAY of the shootings in Newtown! So, because of a lack of understanding, we miss so much of the story when lunations appear. One more critical point: if you have a very sensitive point in your chart, let’s say, at 23 degrees of Gemini and a lunation happens at 18 degrees of the same sign, the main EXPERIENCE or manifestation of that energy will be released FOUR DAYS LATER, i.e., when the Sun has advanced to the 22nd degree of Gemini (since the Sun basically moves through the zodiac at a rate of 1 degree per day [moving 360 degrees in 365 ¼ days]). The transiting Sun and Mars are the main triggers in astrology. They almost always deliver their ordinance when they are one degree away from the target degree. You see, we live with these energies all the time. When one person feels one thing under a lunation while others feel something else, it makes astrology look bad. In fact, it’s really because of a lack of education. After having read just these simple examples, you can see why no astrological writer can cover all bases. This is why many of us seem to write so abstractly and why we need to stay close to the archetypal translations. I hope this has helped to clear up a complex topic.